Wow…1891 to 2007 is represented in this picture. 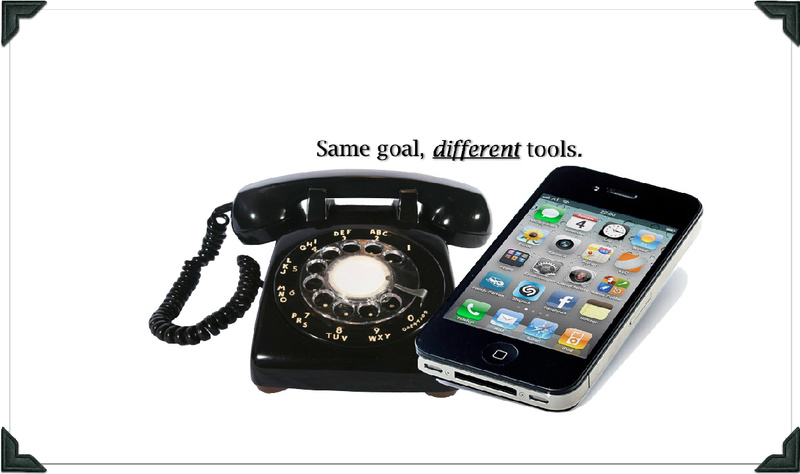 Roughly 116 years between these two phones and the primary function remains the same…..communication. The rotary phone could make single phone calls. That’s it! It couldn’t take messages, offer call-waiting or conference calls, or utilize a contacts list for speed-dialing. The iPhone, however, can do all these…plus countless additional methods to send and receive information. Here’s the problem with the rotary phone today. It can’t be used with today’s technology! It has become obsolete. The need for making phone calls, however, still remains a need today. How would you personally react to a friend of yours if they were insistent on keeping their rotary phone and refusing to move forward with technology? One might think they are ignorant, irrelevant, and/or disconnected from society. Ironically, many of our churches are like this person. Figuratively speaking, they are attempting to Tweet, Blog, and Facebook the vision of their church and the love of Jesus…using a rotary phone! These churches are becoming ‘ignorant, irrelevant, and/or disconnected from society.’ Now, can they still ‘DO‘ good works for the Kingdom? Absolutely! Many times, however, the topic turns to audience. Who and how many do you want to reach with the Gospel message? I don’t recall who actually coined this statement, but I remember it from a conference a few years ago. Referring to the Gospel they said, “Its necessary to constantly change HOW we spread God’s Word, so long as the Word itself doesn’t change.” Jesus modeled this for us. He taught outside in public gatherings. He also used parables. He realized that if He only taught in the synagogues His audience would be limited. In what ways is your church using Social Media to advance the Kingdom? Or…if you have been resistant to, what have been your reasons? I love this! thank you for sharing it with me! God is giving us Christians an opportunity to reach more people than ever! The discouraged that feels inadequate, the weak that can’t get out, the ones that feel ashamed of past mistakes…. sooo many can be reached and encouraged to step out for Christ one more TIME! Keep Boldly leading the way!! We’ll be Matthew 5:16 and light up the sky for the Lord! Thanks so much for the positive feedback. I do appreciate it.